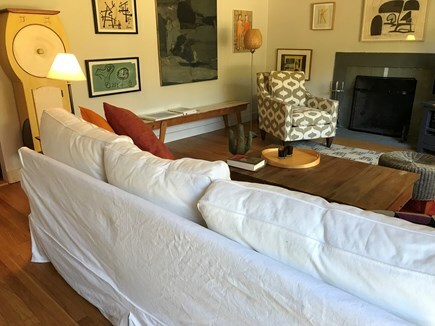 Sunlit, tranquil and immaculate home filled with artwork & books, an expansive, friendly interior with gourmet kitchen, comfortable dining and living rooms, 3 bedrooms, park-like gardens with large brick patio and lawn. Owned by artists, this is an unusual vacation home. The first floor has a wonderful dining room, kitchen, a special reading room off the kitchen, living room, one bedroom, bathroom with shower, and laundry room. Connected by glass sliders to park-like gardens with large brick patio and lawn, gas grill, and unusual shade trees for the best outdoor relaxing and entertaining. Faces southwest and has fantastic light and sunsets. Lots of songbirds add to the peaceful setting. Private outdoor shower with hot water. 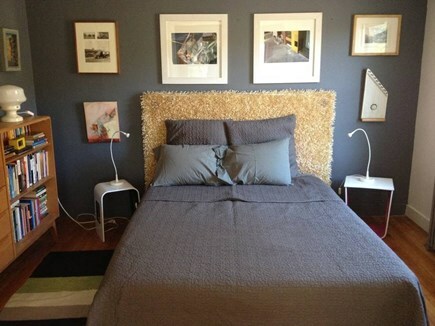 Recently renovated interior has 42 inch LCD TV plus WIFl. 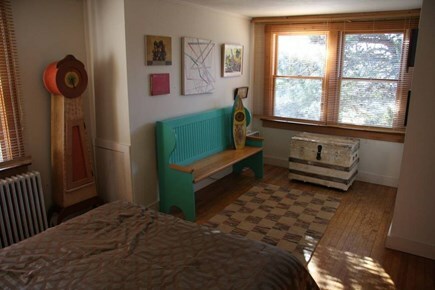 Upstairs are two bedrooms and a bathroom with tub, overlooking wide vistas and filled with light. The house is very private, but we are nearby on a separate part of the property to help with recommendations and any questions. You can get a weekly beach pass to all Town of Truro beaches just down the road at the Beach Permit Office. It is open every day. A security deposit is required. Dogs are considered. State and local taxes of 12.45 percent apply. Additional pricing info: $175. cleaning fee, State and local taxes of 12.45% will apply. 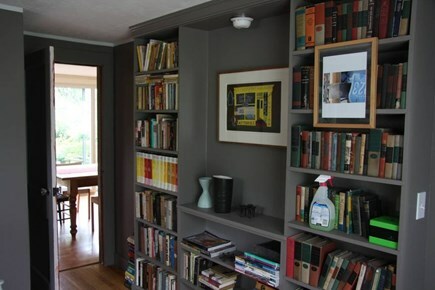 If you think you might like to spend a vacation in a charming house, well designed, filled with interesting art and wonderful books, classics as well as contemporary fiction and art books, this is the house for you. 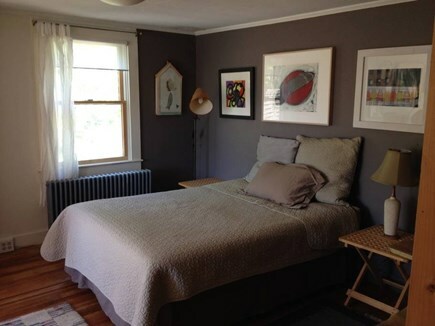 It has a lovely, very well equipped kitchen and spaces, inside and out, for entertaining guests or just savoring the beauty and flavors of Truro. Irene is very willing to help in any way and is nearby if there are any questions or problems. Highly recommended. The house was nice and comfortable. The owners were very accommodating and responsive. We have rented several houses in Truro over the years. This house seemed more equipped with kitchen utensils, linens, etc... Dog friendly which is a big plus. If it’s bad weather the house is full of interesting books to look at and read. Many art books. We had almost perfect weather and didn’t get a chance to look through the books much. Nice back yard area and grill if you want to cook at home. 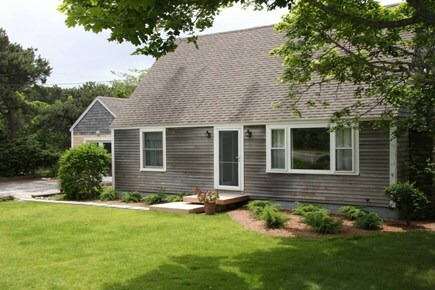 Irene's house was just as promised- a lovely neat and tidy cape house with a pretty yard. The house was very comfortable and close to all the wonderful things Truro (and everything around it) has to offer. Irene was was extremely responsive, and gave us great tips on places to go and things to do. Great choice. 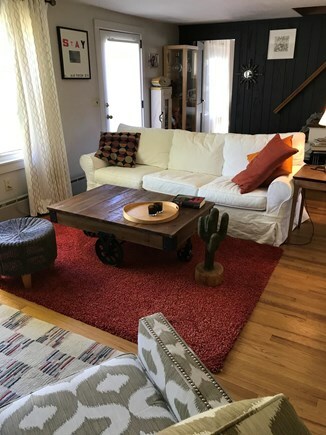 Our family found everything that we needed for a comfortable stay in this eclectic and very interesting home. Irene and Phil were very helpful and quick to respond to any questions we had and although they were close by, they gave us our privacy. Beautiful Retreat at the tip of the Cape. We have had wonderful visits to Cape Cod each year staying at this place. 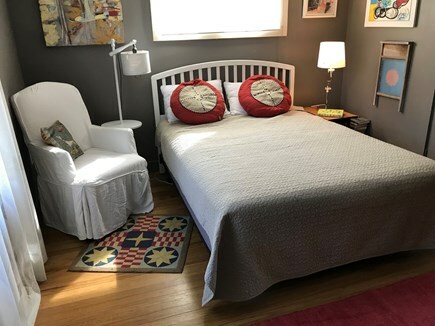 It is not a typical rental as it is filled with wonderful artwork and books and momentos - which makes it so much more personal and interesting. The property is well laid out and well maintained. There are yards in the front and back for relaxing and eating. Easy access to bay and ocean beaches and local restaurants, etc. 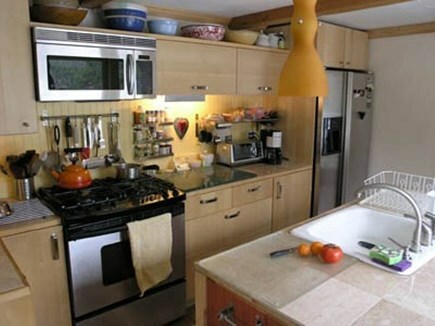 The owners are very attentive and friendly and responsive. My husband and I are both artists. I have been coming to the area throughout my life. 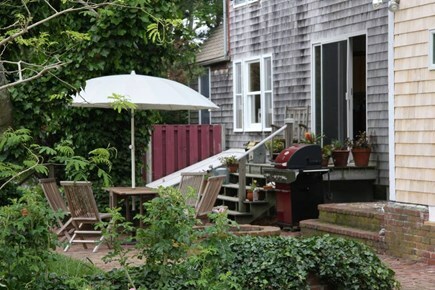 After two Fellowships at the Fine Arts Work Center, we decided to move from NYC to Provincetown. 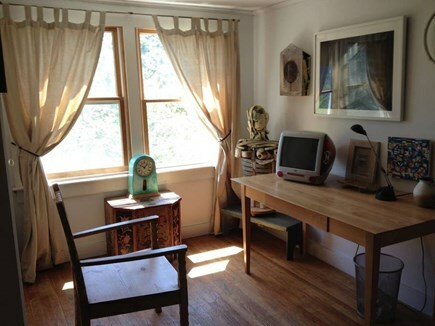 When we realized we could not have studio spaces at that house we found this house, with land to build studios. 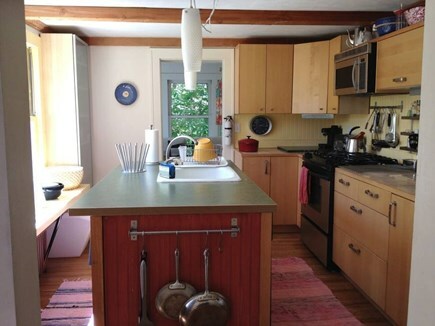 We love the house and the land and have put a lot of care into renovating both. 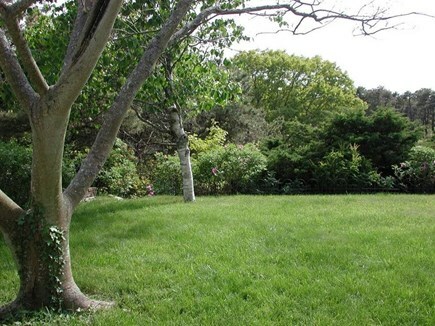 It is a unique property because serious gardeners owned it in the sixties. They put in many trees and plantings that have lasted and are very established, with many elements that are unusual for Truro, like the beautiful mimosa and birch trees. It is a habitat for many birds and rabbits. They also excavated the land with terraced gardens, planning for orchards which never came to be. 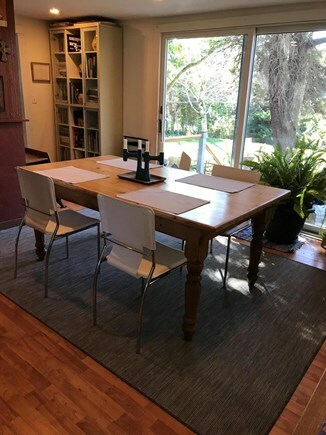 With two distinct levels to the property and a road going to the lower part where my studio and summer home are, there is a great deal of privacy for everyone. I love living here because while it is so rural, it is so close to the little town of North Truro, which has some very lovely small businesses: a store/deli/liquor market, a restaurant, a wonderful homemade chocolate shop and cafe, Truro Vineyards (with a great food truck), and the Atlantic Spice Company. The town library, playground and community center are just around the corner. It is a historic village with beautiful old homes along Pond Street—an enjoyable way to walk to the bay beach. It is easy to avoid Route 6 even when going to the ocean. And Provincetown, only four miles away, is easily accessible by car or taxi or a frequent shuttle bus.